The one thing it wasn’t was in stock. I didn’t want the shelf display model, so I placed a special order and Best Buy said a new one wouldn’t be in until December 27th. And that’s where the story gets interesting…. I called the store at 10:10 am to see if the TV was ready to be picked up. The obviously-busy gal in customer service said the truck hadn’t arrived yet, and they’d call me when it did. I called again and a different gal told me the TV was ready to be picked up. Wheeeeeeee!!! I wrapped up a couple emails and drove into Kennewick. The line for customer service wasn’t as bad as I expected, and I was able to get my TV pretty quickly. 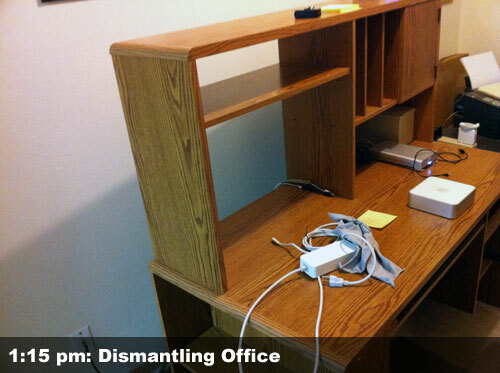 I got home about 12:15 pm, ate lunch real quick, and then started dismantling my office. The plan was to mount the new TV on the wall in front of me, which would require that I remove the hutch on my desk, and then also get rid of some old electronics (stereo, VCR) that I don’t use anymore to clear up even more space. By about 1:15 pm, the desk was pretty much empty. All my files, papers, and everything else was in the kitchen. After clearing out the desk, I could easily move it far enough away from the wall to start working on the bracket mount for the new TV/monitor. When I got the desk out of the way, I went out to unpack the new TV and figure out exactly where it would fit on the walls. I had already lined up where the studs were and made the general markings on the wall. But when I opened the TV box, big problem! The TV was completely unwrapped. The screen had all kinds of dirt and fingerprints on it, and what looked like 3-4 scratches. The accessories (cables, instructions, papers, etc.) were unwrapped and also just tossed randomly in the box. 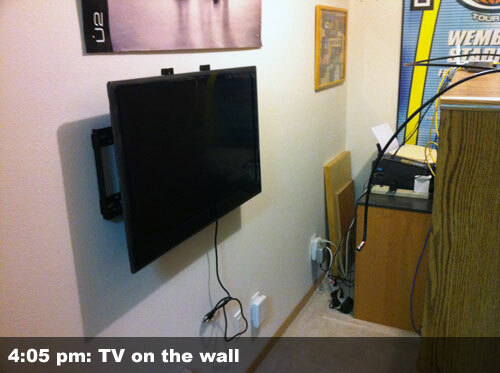 In lieu of padding, there were rolled up Wal-Mart plastic bags being used in between the TV and cardboard. WTF???!!!!! was pretty much the main thing going through my mind at this point. 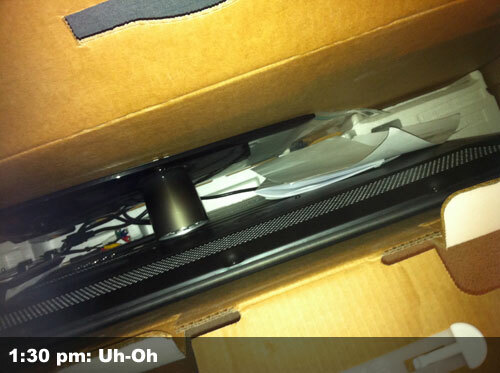 It was either a used/returned model, or it was an open box display unit. I tried cleaning up the screen and scratches but couldn’t get the worst stuff to go away. So I had no choice but to take it back … right in the middle of my project. I got to Best Buy and waited in the line for a few minutes before a customer service gal called my turn. She was pretty dumbfounded when I told her what was going on and when she opened the box herself. Even the CSR at the next station was following along, and they both agreed that it was an open-box display unit. She sent one of the grunts back to see if they had a new one in stock, but I quickly told her that was unlikely because I had special-ordered this one THREE WEEKS AGO. I also told her that if I had wanted a display unit, I could’ve bought the one here in this store back on December 7th! She didn’t find any others in the computer, as I promised, and started looking for comparable models to offer me instead. Nope, I don’t want a Panasonic, Sony, or Toshiba. LG or Samsung only. Gotta be 1080p and it’s gotta be 120hz. She didn’t have any comparable models except at the 37-inch size, but I told her that was too big for my space. She suggested they could have someone clean up the TV, work on the scratches, and then take it back to the TV area and let me see how it looks in action — and if I wanted it, they’d give me a discount. I asked her, instead, if she could see if a new one was available in any other Best Buys around the state and then have it shipped in. Nope. None available. The computer says this model was discontinued. By this point, a male supervisor guy had come over and wanted to hear what was going on. She explained and he got on the computer to try helping. He and I went through some of the same options I already covered with the gal … meanwhile, she went and got some real TV screen cleaner and a couple nice cleaning pads and I couldn’t help but notice she was doing a great job fixing up the screen. It looked like what I thought were scratches was just dirt, and it was pretty darn clean when she finished. I got nowhere with supervisor guy and when he said my choices were to either take a full refund or pay a little more for a different TV, I asked if we could try the TV back in the TV section because CSR girl did a great job cleaning it. We watched about 3-4 minutes of some movie and the screen looked terrific — no dirt, no scratches, just like new. I told supervisor guy that I’d keep this TV if they’d give me a discount since it’s an open-box unit. He said they would. CSR gal gave me a $100 cash refund and sent me on my way home. I got home at about 3:00 or 3:15, I think. Time to rush now. Still had a ton of work to do and I’d lost over an hour going back to Best Buy to deal with their cluelessness. First step was to finish getting the brackets mounted on the wall. That was pretty easy. Get a Cheetah Mount bracket if you’re in the market for one. Really solid and not too tough to mount (even though the printed instructions are a bit lacking). 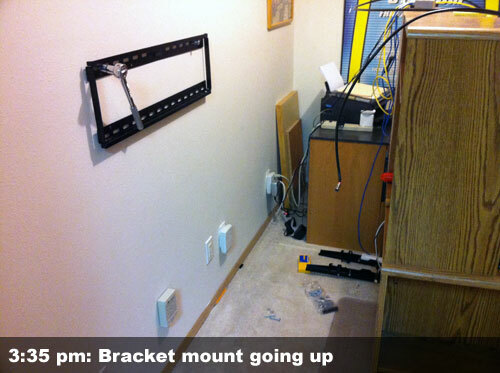 Took me about a half-hour to get the brackets on the wall and the TV followed right after that. 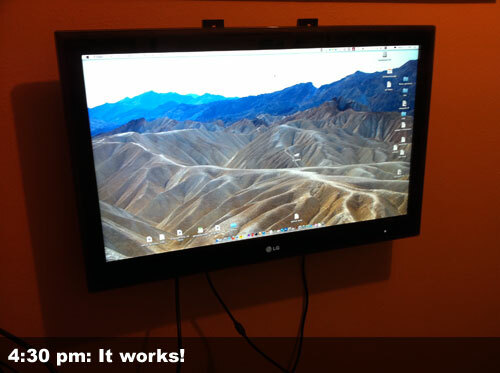 With that TV on the wall, it was time to run some simple connections to make sure everything worked correctly — that I was getting a TV signal, that I was getting a signal/connection from my computer, etc. Problem was … I couldn’t find the right connector to hook up the computer to the TV. 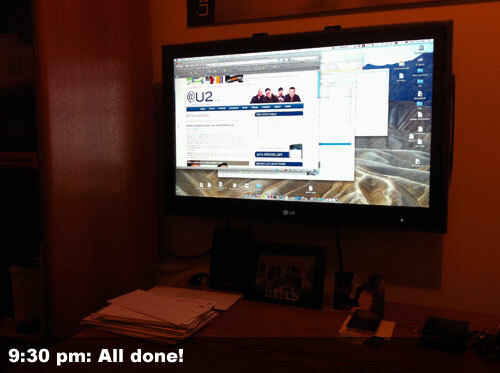 Searched all over until I remembered that (more than a year ago) I had hooked up my laptop to the TV in our family room so I could watch U2’s YouTube concert on the big screen. Bingo! Found the connectors/cables there and got everything working in my office. So, with the TV mounted and everything working correctly, it was time to finish the office itself. I dismantled the hutch from my desk. Moved all my stuff from the kitchen and piled it in my office. Took a break for dinner. Got back to work. Watched some of the Monday Night Football game while I worked. Went through a week’s worth of mail that had built up while we were in California last week. And then I finally finished at about 9:30 last night. Web sites (some, not all) look nice on a big screen. But some sites with small font sizes are now impossible to read. I’m gonna need glasses one of these days. Probably sooner rather than later. But that’s okay. Me and my open-box TV … we’re quite happy together. Especially since the final cash cost for me was $260 (not counting gift cards used) — pretty good for a $900 TV, I’d say. I’d also say that Best Buy is utterly clueless. Sending someone an open-box TV and pretending it’s new?? Making me wait three weeks for a display unit when I had ordered a new one?? Clueless. We are the Champions … Again! Man. What a hassle. It’s stories like this that make me always order from Newegg for all things computer related. It looks good up on the wall. For a second I thought you painted your wall red in the 25 minutes between 4:05 and 4:30.